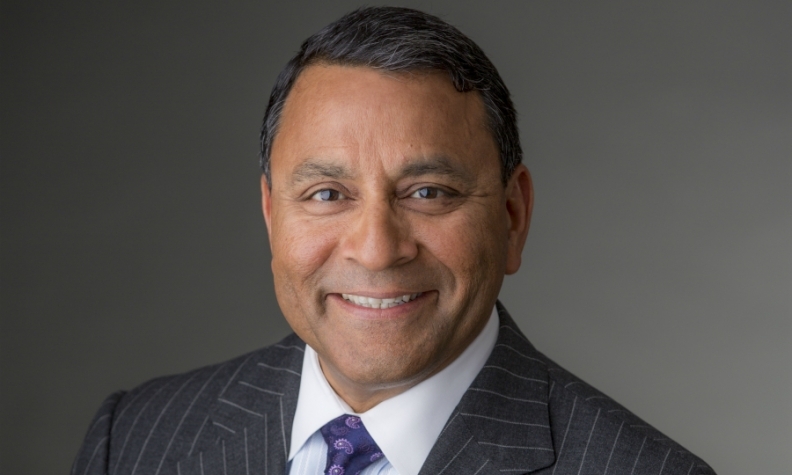 Dinesh Paliwal: "All the analyst groups, IHS, etc., are saying in three to five years onboard penetration of infotainment will be 60 to 65 percent globally." Harman International, which supplies high-end infotainment systems for top models from Mercedes-Benz, BMW and other premium brands, is looking for more business, both from luxury automakers' volume models and from other automakers such as Volkswagen and General Motors. Fast-rising demand for connectivity solutions calls for top-level software skills, something that Harman has been adding through a rapid succession of acquisitions. Harman CEO Dinesh Paliwal outlined the company's plans in an interview with Automotive News Europe Correspondent Nick Gibbs. How is Harman doing financially? In the fiscal year to June 2016 we will have achieved about $7 billion in sales, of which $4.5 billion is automotive. Seven years ago we were doing around $2.9 billion so we have more than doubled. Has that growth all come from automotive business? Automotive has been our fastest growth driver, particularly connected car [which is a separate business division at Harman that reported nine-month sales to March 31 increased 5 percent to $2.26 billion]. We have had an [overall] net market-share gain for the last three straight years. Where has that new automotive business come from? We dominate high-end luxury cars, but our rapid growth has primarily come from the midsize segment. For example, the Mercedes C class and BMW 3 series as well as with General Motors, Volkswagen, Fiat Chrysler, Hyundai, Toyota and Subaru. At the same time, we have also gone into the Chinese market. Europe is about 35 percent of the automotive business. The U.S. is about 40 percent. Asia and elsewhere is the rest. MAIN CHALLENGE: Boosting Harman's software capability while maintaining its dominant position in automotive audio and infotainment. What has been your best midsize segment conquest? That would be FCA (Fiat Chrysler Automobiles). The next one is GM. And at Subaru we replaced a Japanese competitor. How fast is the infotainment sector growing now? Traditionally it has been 2 percent to 3 percent every year. But three things are happening: 1) car production is going up, which helps us grow, 2) we see more adoption of our technology in the cars and 3) we have gained market share. We think we are at the point where this linear growth of 4 to 5 percent is going to become non-linear. All the analyst groups, IHS, etc., are saying in three to five years onboard penetration of infotainment will be 60 to 65 percent globally. What is the current percentage of penetration for the technology? About 25 to 27 percent. So it will more than double in five years. Europe is running at around 25 to 30 percent. Japan is the highest at about 65 percent. China is single digits. The U.S. is about the same as Europe. China is a huge opportunity for us. Our revenue is about $4.5 billion. We have a $25 billion order book. And that is based on current adoption rates of 25 to 27 percent, so as this curve starts getting non-linear we think Harman can double this business in the next five to seven years. You produce the hardware. What opportunities are there for you on the software side? First of all, 70 percent of our added value comes from our software engineering. We are in the hardware business to enable our software solutions. That’s how I describe it. We are heavily invested in software. Where have you invested in software? Last year we acquired a California software applications and engineering cloud company for $1 billion called Symphony Teleca along with 9,000 software architects and engineers. Subsequently we acquired Red Bend Software, a world leader in over-the-air (OTA) updates. It updates cars from Daimler and Tesla and others. Earlier this year we acquired a company in Israel called TowerSec, a leader for automotive cyber security. We also have launched a new [infotainment] architecture called LIVS. It’s based on Google/Microsoft/Linux open-source yet it’s also proprietary. It means we can build very complex architectures for high-end cars but also have simpler version of the same technology for entry cars. Do you have a plan for the data produced? We don’t want to get into a debate about who owns the data. We want to be the data manager. We can get the data through our own infotainment systems, through our telematics, then we can look at driver behavior, we can do proactive diagnostics on the car ahead of planned service intervals. We can carve out a stream of data for insurance companies. That's an interesting question. We want to have a subscription-based service, for example if you’re providing data back to the dealership. Same for the Red Bend over-the-air software updates. That's a subscription service and we get paid on how much the customer uses or on an annual basis. What will that eventually be worth in terms of revenue? Perhaps 10 to 20 percent? We have not given this number to anybody because this is evolving. Sometimes it would be embedded. Let’s say if we have a $2 billion contract with BMW, maybe it's part of that package. Or maybe it's carved out so we sell it as valued-added software services. We have four to five Japanese companies. We have Bosch and Continental from Europe and Delphi in the U.S. We dominate premium. In mid-segment we are growing fastest and where the growth is. What are the Chinese companies asking for? Chinese companies want everything we do for Daimler and BMW but they don't want to pay for it. We understand that. So we are finding a solution. We are taking much of our technology from the West and localizing it to bring the cost down and adapting it for Chinese needs. How can you reduce the price and keep the quality in China? By being local. We have made pretty serious capital investments over the last seven to eight years in China. We have grown revenue from less than $50 million in 2008 to $700 million last year. We now have r&d centers in Shanghai, Shenzhen and Chengdu. We have multiple factories under one roof near Shanghai and another factory in northern China. This is all new in the last five to seven years. What do Chinese customers want? Ease of use. The experience in the cockpit makes them buy the car. Audio is very important. Brand is very important. But more importantly they want connectivity. So we have developed r&d not only for Western phones but also local phones. Harman was first to develop with Baidu Carlife, which is like what CarPlay is for Apple. Are you making products in China to sell in the rest of the world? Not so much. Our philosophy is that Asia should be self contained. Our manufacturing for Europe is out of Hungary, our U.S. manufacturing is in Mexico, our Asian manufacturing is in China.